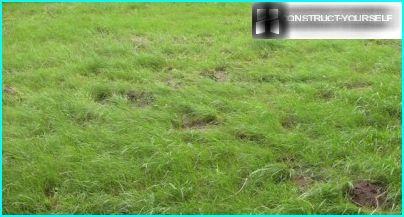 If you own from scratch raised lawn, thendefinitely you will experience how the grass will take the first winter. 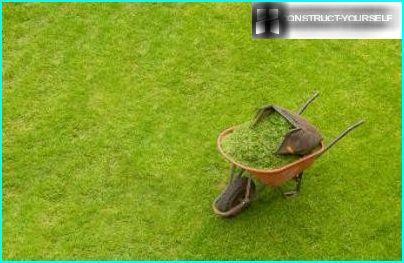 After all, the lawn a lot of effort has already been invested, and you do not want to disappoint the spring results. But experience is not necessary, if the time and correctly prepare the lawn for winter. This problem should disturb the hosts, taking care of a lawn in autumn. Consider a series of major works of autumn, which will help the grass survive hibernation successfully. 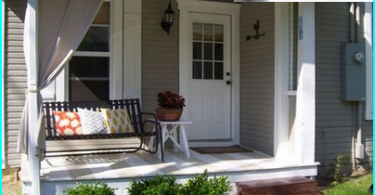 Lawn mowing: how not to miss? Should fit a lawn in autumn? In the winter the aerial part of the lawn and vymerznet vypreet,so owners have to throw all the forces to strengthen the roots. They will spring shoots thick and should not die in the cold. Strengthens the root system in two ways: mild dressings and aeration. To power the autumn lawn only suitable phosphate and potash fertilizers,that help to maturing plants. Completely eliminate nitrogen fertilization. They accelerate the growth of grass and provoke the development of young shoots, and by the winter it is just not necessary, because the young shoots harder tolerate freezing temperatures, and die first. Where do we get the phosphorus and potassium? You can search the autumn sale of complex fertilizer for the lawn. But cheaper to buy separately: potassium sulphate and superphosphate. By the way, a lot of potassium found in wood ash, so if you are in the summer often fired fireplace or roasted kebabs on the grill, you will extract fertilizer is absolutely free. Feed the better before the rain. In the autumn it will not be difficult, because the rainy weather in these months has consistently pleases. It is desirable that feeding occurred in the early autumn (September). Then the grass a better chance to absorb and assimilate the most nutrients from fertilizers. Aeration is no less important to the roots. Getting a lot of oxygen, the roots grow ripe faster and stronger. 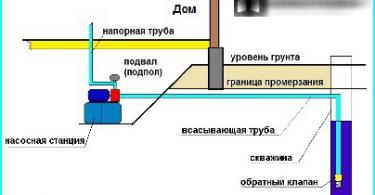 In addition, through punctures during long cold rain water goes into the deeper layers of the soil, and does not remain on the surface of puddles that with morning frost will turn into ice. The easiest way to move a lawn conventional fork piercing of the lawn in many places, and leaned over to lift the roots. 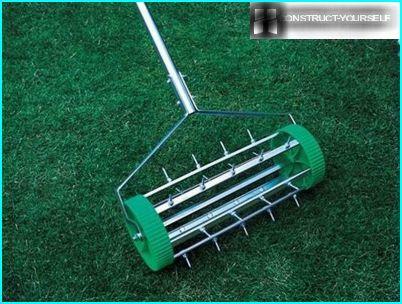 It can also be used for aeration of the lawn in autumn special devices - tips on the Tillers or aerators. Spend a stir in dry weather. Autumn lawn chores with less bulky than the summer, but it depends on them, how well it will take the winter grass. Any lawn (and this year, and growing longerseveral years) should go under the snow with a "haircut". If the weather is warm, the autumn haircuts may be several. But the most important to you - the last one. It must be done in about 2 weeks before the first frost in your area, to the grass time to grow back to 6-10 cm. If its height is less, then the probability of freezing of roots at strong frosts. If the lawn has time to rise above 10 cm, ie the risk of damping off. For example, when alternating frost and thaw, ice crust is formed. And if the grass under the snow goes with a crust, it will suffocate without air and vypreet. In addition, in the spring of withered grass becomes an obstacle to the penetration of new land sprouts. It will block them as mulch, which does not allow weeds to grow. 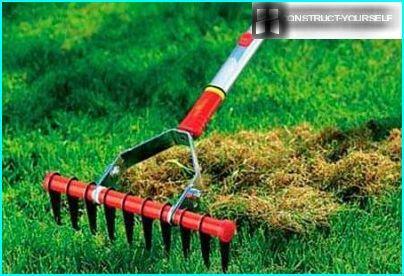 Stopping the growth of spring and the grass cuttings will be,if you do not remove it from the lawn in autumn. After mowing the lawn is sure to comb fan-shaped rake to remove debris from it, the old grass that forms the felt, and the last mowing. Take a wheelbarrow all the collected "wealth" right on the empty beds and prikopat. During the winter of herbal waste will clean fertilizer. By the autumn lawn care and includeredecorating. Small pits and potholes can be at this time to completely level and covered with a mixture of humus and sand. 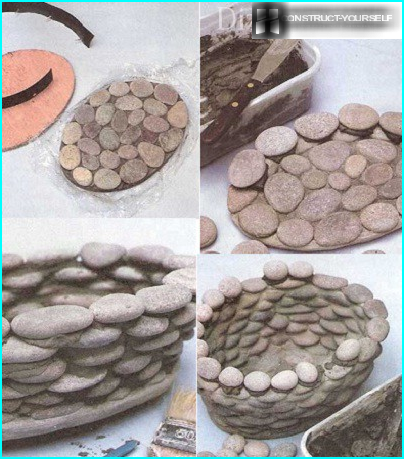 Large holes leave in the spring, because they will have to add grass seed. Not bad for the autumn lawn responds podsypku a mixture of peat and compost. 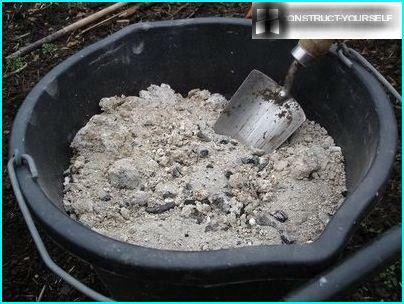 Crumble mixture over the grass, you will level the ground at the same time, and fertilize the soil. When it is the season of torrential rains and the soilbecomes soft, it is necessary to insure the lawn by trampling, if you often pass through it to the other buildings. To do this is to outline the grass boards, and move only on them, as the pressure of feet "plays" the soil, and on the lawn are formed pits. If the weather is dry, it is better to put the board after the stable sub-zero temperatures. So you least primnete over the winter grass and avoid "bald patches" that often appear on the footpaths. And it is better not to go for the winter dormant grass. Understand the intricacies of care by highlightingand planting grass. Some gardeners too late to complete the site preparation for future lawn, and planting seeds just gets in the summer. If we compare the summer and autumn sowing lawn, the preference is to give the autumn. For good germination of the seeds need a moist soil and a lack of heat. All this - the obvious signs of the September weather, when the rains come and the days are warm, but not hot. In addition, planting a lawn in the fall gives a more friendly shoots, because the grass does not interfere with the weeds. They are by this time beginning to prepare for the winter and germinate poorly. If you hold a quality site and diggingselect the roots of perennials, you can not even shed soil herbicides. 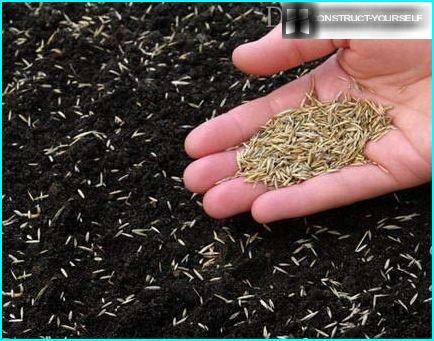 Sow the land and wait for germination. However, with planting dates should not be delayed. September - the best time. Before the cold blade of grass will have time to get stronger and grow so that you can mow them once. But try not to mow right up to the ground, and only the tops. Some gardeners recommend planting and podzimny, t.e. the landing of the seeds in the soil podmerzshie (around November). Then you wait for germination in early spring, and they are strong, because the hardening frost have passed. But in our climate, there are several factors that can spoil such planting. First, in areas with a slope of spring floods may wash away some of the seeds along with the snow. Secondly, the fall may be delayed, and after a cold start the thaw. Feeling warming, seeds hatch, sprout - and "still lukewarm" kill the first winter frosts. If addressed at podzimny landing, it is necessary to sow the seeds of a greater share than usual, with the expectation of partial freezing.